Historically speaking, Rangers FC (also known as Glasgow Rangers) is one of the most dominant football clubs on the British Islands. Since its inception in 1872, the club has won 54 Scottish Championships and 33 Scottish Cups, as well as the 1972 Cup Winners' Cup. Since 1888, they have enjoyed a fierce rivalry with Celtic, with the two clubs being traditionally referred to as the "Old Firm". 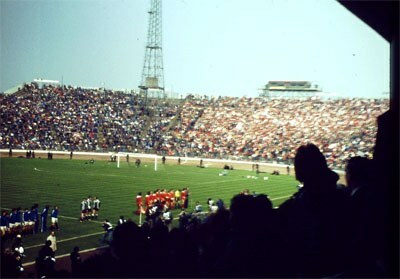 Aberdeen and Rangers before the 1978 Scottish Cup Final. Rangers was founded in 1872, by a small group of rowing enthusiasts; while the club was originally named Glasgow Argyle, it was renamed to Rangers at one of the first club meetings to be held. In 1886, they did their first appearance in the FA Cup (they had also been listed the previous year, but withdrawn). They were one of the eleven clubs to participate in the inaugural Scottish Championship in 1890, eventually going on to share top honors with Dumbarton in the first season of the competition. By 1919, Rangers had won nine Scottish Championships and four Scottish Cups. In 1920, the club's long-time assistant manager Bill Struth was promoted to manager; this marked the beginning of an unprecedented 34-year long period with him in charge of the club. It was during this time that Rangers finally replaced Celtic as the best club in the country, claiming 19 Scottish Championships and 10 Scottish Cups by the time Struth left the club in 1954. The torch was then passed to Scot Symon, who led the club to another six Scottish Championships and five Scottish Cups before a streak of bad results led him to leave Rangers in 1967. The early 70s were not a particularly happy period for the club due to the 1971 Ibrox disaster, when a large-scale crush led to the deaths of 66 people. Nevertheless, the following year saw the club recover from the tragedy to win their first European trophy by outlasting Dynamo Moscow 3-2 in the Cup Winners' Cup final. Not long after that, Jock Wallace took over as manager and eventually managed to halt Celtic's domestic dominance by claiming three Scottish Championships and three Scottish Cups from 1973 to 1978. With only two Scottish Cups to their name in an 8-year period after Wallace's departure, it was high time for changes. The club returned to the spotlight with the appointment of Graeme Souness as player-manager in 1986; this hiring led to the so-called Souness Revolution, which saw Rangers acquire a number of high-profile signings. Souness – and later Walter Smith – led Rangers to nine consecutive Scottish Championships and three Scottish Cups from 1987 to 1996. Even after their departure, the club continued to ride a streak of good results, claiming seven Scottish Championships and six Scottish Cups by 2011. Due to numerous financial difficulties surrounding the club, the 2011/12 season saw Rangers enter the process of liquidation. While the club went on to transfer its assets to a new company (soon renamed The Rangers Football Club Ltd), they had to start their new journey from the fourth tier of Scottish football. Rangers logo consists of a blue ball with a red lion outlined by a circle with “Rangers Football Club” in uppercase letters. The word “Ready”, which stands for the club's motto, could also be found in the logo. There is, however, an alternative logo used on the shirt, which is based on the intials of the club's name (RFC).